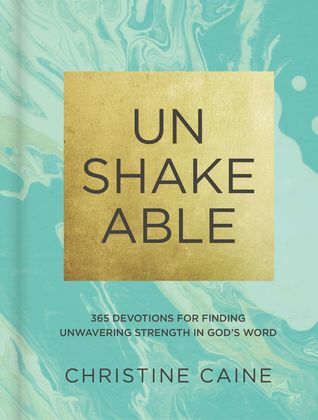 Unshakeable: 365 Devotions for Finding Unwavering Strength in God’s Word By Christine Caine was published on October 24th, 2017 by Zondervan. God is bigger than your current story. Bigger than fear or shame or that voice in your head that whispers that you are not enough, too broken, or too flawed. Join Him in a closer relationship—one rooted in truth and Unshakeable. In this daily devotional Christine Caine encourages you to find confidence to live as the person God created you to be. Everything in our world that can be shaken will be shaken. And yet, the Bible assures us it doesn’t matter what happens politically, morally, socially, or economically in the world around us if we have Christ in us—if we have the kingdom of God within us—because His kingdom is Unshakeable. About the author: Christine Caine is a recognized teacher, preacher, author, and activist. As a founder of The A21 Campaign, Christine leads one of the largest non-profit organizations in the world dedicated to rescuing victims of human trafficking in twelve countries. Additionally, through her personal ministry, Christine shares messages of hope, encouragement, and freedom in churches across the globe and frequently addresses leaders of some of the world’s largest organizations. Christine and her husband, Nick, spend their time in both Sydney, Australia, and the United States, and they adore their daughters Catie and Sophie.